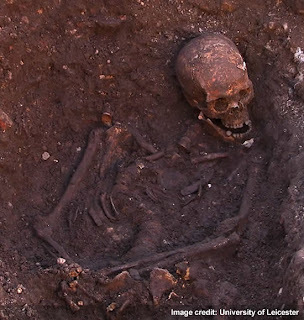 The skeleton of Richard III, found in a car park. Now that the excitement from yesterday’s announcement of the finding of Richard III’s body has abated a little, I thought it only right to do a little post. I looked at all of the evidence, which, although it could be considered circumstantial by harder-nosed academics, was certainly enough to convince me on the balance of probability alone that the skeleton found in the car park was indeed England’s lost king. I must admit, when the find was first announced I thought it very unlikely that the bones found would turn out to be anything other than either an abbot or maybe even a patron from another time period. I thought that maybe Leicester university were pulling off a very clever piece of PR maybe to gain more funds for the project or at the very least, recognition for the institution. As such, I refused to let myself get too excited – I’ve watched far too many series of Time Team to know how such digs can end up being ultimately disappointing after promising so much. Nevertheless, as I prepared to watch the announcement yesterday, I found myself sitting on the edge of my seat. Little clues had appeared in the press over the recent days as to the result being positive – but even so, I needed to hear those words confirming it to be so. And when I did, I must admit that I cried – even though I am no Ricardian, and that my period of study is not the Wars of the Roses. There were no two ways about it though – it was an emotional event. Of course there has been criticism about the way the DNA was used (by all accounts mitochondrial DNA can often lead to mistakes being made, as in the case of Cheddar man) – but all in all it would seem churlish to dismiss the findings when so many other details correlate with historical record. There was also alot of criticism from some quarters about the program on Channel 4 which showed the whole thing from the car park being dug up to the final analysis. So who do we dig up next? What historical mysteries can science solve now? The Princes in the Tower perhaps? Or whether it really is Edward II buried in Gloucester Cathedral, and not some stand in while he escaped to live in peace in Italy. Now we have Plantagenet DNA, both would be possible. But even if we proved the skeletons found at the tower were those of the princes (that is, i the DNA in the bones is still viable), we still would not be able to solve the problem of their fate. As to Edward II, would it really be worth it to desecrate his tomb just to satisfy our curiosity? Science has started to open up the world of archaeology and history – and I have long advocated a multi-disciplinary approach to looking at the past – but I also think we must take care not to push too many boundaries just to satisfy our need to know. The dead still deserve respect, no matter how long they’ve been dead: at least Richard’s body will now be found a more suitable resting place than underneath a social services car park. *As I write, I have just come across the publicised journal account of this find with all of the sources for her speculation that I was previously missing. Therefore, to be fair, I need to go over it again now to see if she can still convince me that Hugh has been found too. Watch this space! Tagged Hulton skeleton, Richard III. Bookmark the permalink. I found your blog in Michael Jecks books. I love it! I just finished writig a book about Richard the Lionheart and Robin Hood. Do you have any leads on agents I could send it to now? Hi Eddie, and thankyou for your kind comment. Sorry about the late reply but I only just noticed your comment. As to agents – you are better off doing your own research on what agents accept historicals. Try The Writers' and Artists' Yearbook for a list of agents and what they're looking for. Good luck.